It’s true – good things come in small packages. Just take a look at the increasing popularity of the retro-styled Nissan Figaro, which made a starring appearance on the X Factor Live Finals, one of last year’s most watched series. And it would appear that celebrities and sports stars cannot get enough of this right-hand drive 1991 model, with owners including TV star Dermot O’Leary and Premier League and more recently La Liga footballer Thomas Vermaelen. So, what’s all the fuss about with this stylish convertible that was aimed at the Japanese market? Only 20,000 models were ever produced – 8,000 were originally made with an extra 12,000 built due to high demand. In fact, prospective purchasers had to enter a lottery for the chance to buy one. It is based on the Nissan Micra and built at Aichi Machine Industry aka the Pike Factory, a special projects group that was also responsible for a number of other niche cars. As for its name, that is reference to the title character in the play The Marriage of Figaro, while the car was launched under the slogan ‘Back to the Future’, a deliberate nod to Nissan’s classic cars. For those of you who don’t know, it was produced in four colours representing the different seasons. They are Lapis Grey for winter, Emerald Green for spring, Pale Aqua for summer and Topaz Mist representing Autumn, although two additional cars were also painted in different colours. Aside from its postmodern looks, most are fitted with automatic transmission, plus boast leather seats, air conditioning, a CD player and an opening fabric roof. No surprise then that it is a very popular classic. 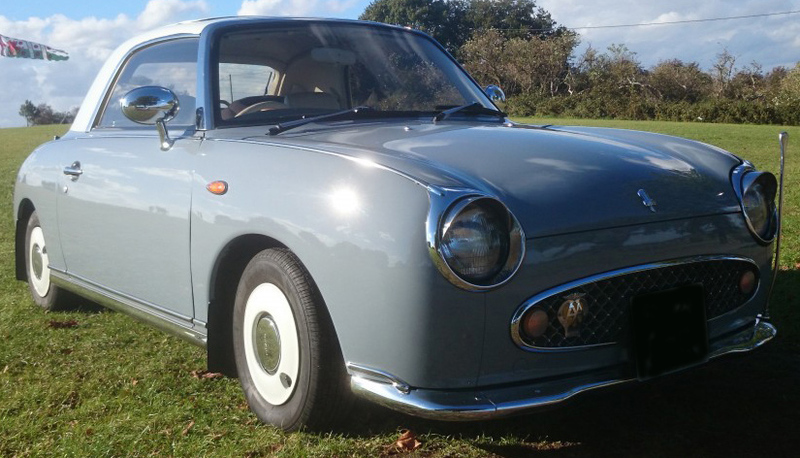 ClassicLine Insurance would love to hear from you if you own a Nissan Figaro.